This sweet honey cheesecake is complimented by a shortbread crust made with apple chips and chopped pecans. In a medium-sized bowl, use your hands to mix together all ingredients except apple chips. Evenly press into the bottom of a greased 13" x 4" tart pan with a removable bottom. Place tart pan on a large cookie sheet and bake for 8 minutes. Process all ingredients except apple chips until completely smooth. Pour over pre-baked crust until the pan is full. Pour any extra batter into a small springform or a ramekin. Bake for 30 minutes or until the center is still a little jiggly but the edges are completely set. Turn the oven off, but leave the cheesecake in the oven for another hour with the oven door cracked slightly to gradually cool the cake. Remove from the oven and, once the cheesecake cools to room temperature, place in the refrigerator to chill for at least three hours. Right before serving, crush half of the apple chips (the less pretty ones) and scatter them on top of the cheesecake. 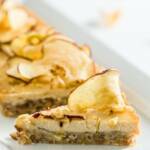 Arrange the remaining apple chips in a line (or whatever looks artful to you) across the top of the cheesecake. This recipe will also work in an 9" round Springform pan. If you want a taller cheesecake, you'd need to make 1 1/2 times the batter and increase the bake time to 50 minutes.